US Army MWR :: 2019 Strong B.A.N.D.S. Make positive changes in your health during May with Strong B.A.N.D.S. Strong B.A.N.D.S. 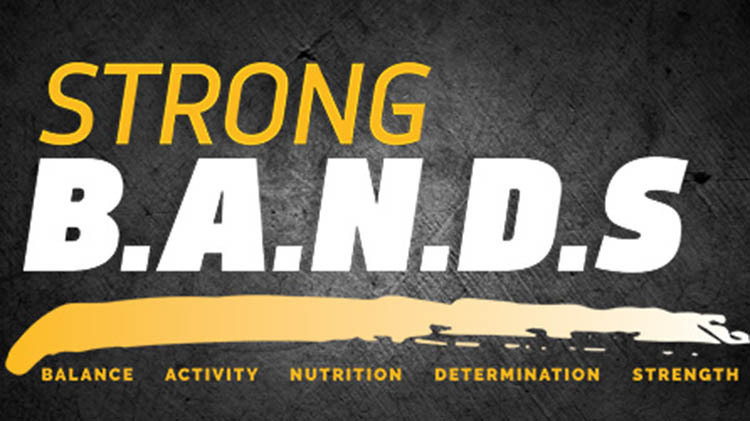 - Strong Balance, Activity, Nutrition, Determination and Strength - promotes healthy, active lifestyles for Army communities. Throughout the month, it motivates Army Soldiers, Families, Retirees and Civilians to get and stay fit. There are lots of ways to get involved! Participate in garrison fitness and wellness programs. Learn about health and fitness topics with our online resources. Make our nutritious recipes at home. And don't forget: share your news with friends and family, and invite them on the adventure, too! Get your Strong B.A.N.D.S t-shirt by visiting the events below! Kawamura Human Performance Center, 9250 Gunston Rd. For more information, call +1 (703)806-4430 or visit the KHPC Facebook Page. 9 - 10 a.m. and 10 - 11 a.m. Outdoor Recreation, 10155 Johnston Rd. For more information and to register, call +1 (703)805-3081. Pullen Field/Specker Field House, 1182 12th St.
For more information, call +1 (703)806-5093. Specker Field House, 1182 12th St.
For more information, call +1 (703)806-4430. Participants must register online on biketoworkmetrodc.org for shirts and prizes. Pit stop location: Walker Gate (on Mount Vernon HWY) from 6:30 - 10 a.m.
For more information, call +1 (703)806-3447. Rats Cycles, 6006 12th St.
Bike checks, tire inflation, informtaion about Rats Cycle group rides. For more information, call +1 (202)556-1172. Pullen Field, 1182 12th St.
For more informaton, call +1 (703)805-9138. MWR Library, 9800 Belvoir Rd. For more information, call +1 (703)805-4244. North Post Outdoor Pool, 2430 Abbott Rd. For more information, call +1 (703)805-2620. Functional Fitness, C.O.R.E, Yoga, Body Sculpt, Zumba, ChakaBoom, Indoor Cycling, and Turbo Tabata.